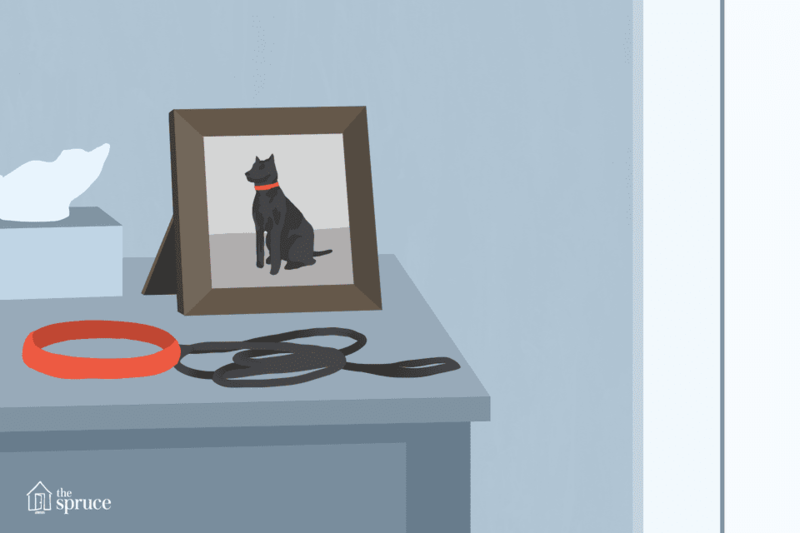 Grieving for the loss of your pet is an important part of coping. If you have lost a special canine companion, the emotions can become overwhelming. Take some time out to grieve for your dog. Celebrate the bond you had with your pet. Don't be afraid to cry. It takes time to heal. Because your pet was an everyday part of your life, even the most mundane tasks can be heartbreaking. You might catch yourself getting ready to feed your dog, only to remember your pet is gone. Chances are, you will come home sometimes expecting your dog to greet you. Little things like scratch marks on the floor from doggie nails can trigger an emotional response. Items like dog beds, toys, bowls, leashes, collars, etc. are obvious reminders. However, getting rid of all the things that remind you of your dog is not necessarily the answer. If you wish to remove your dog's belongings from sight, simply store them away somewhere. You might want to go back and look at them in the future. Denial: The initial shock of loss leads to disbelief. Emotional numbness acts as a form of self-defense from reality. Anger: As reality sinks in, anger will begin to develop. This comes from a combination of your emotions and almost acts as a way to exhaust the stress. This stage often causes the mourner to lay blame on persons or things for the death. Bargaining: This is the "what if" stage. The grieving person envisions a way to have prevented the death. Guilt often accompanies bargaining. Depression: This can be a difficult stage to endure, but it is expected during the healing process. A sad situation calls for sadness, and the reality of the death can cause a person to get very low. It is normal, but not without end. However, serious long-term depression is a sign to seek help from a professional. Acceptance: Though the sadness and grief may remain forever, the acceptance stage means coming to terms with the reality of the death. Accepting it does not mean you are "over it." Acceptance simply means you understand that life goes on. Doing something special to preserve the memory of your beloved companion can be very therapeutic. Some pet owners even decide to have a small memorial service after the death of a pet. The important thing is to do something from your heart that will help you remember your dog and process your grief. If you were able to make arrangements before your dog died (as in the case of euthanasia), you might have gotten the chance to create a paw print out of clay or ink or collect a lock of hair. If you did not get a chance to do one of these things, save some of your pet's small belongings. Consider displaying one or more of the items (paw print, a lock of hair, dog collar, favorite small toy) in a window-box frame with a photo of your dog. A small inscription with your dog's name will complete the memorial. You can even hang it near one of your dog's favorite spots in your home. Consider planting a tree or other plant in your yard, and scatter some of the cremains (ashes) in the dirt around the plant. A decorative stepping stone can be placed there with a message or the name of your pet. One unique way to remember your pet is to create a unique artistic memorial from the cremains. The company Art From Ashes has been creating beautifully handcrafted glass remembrances of pets for many years. Due to high demand, they even began to make pieces from human cremains upon request. Some owners decide to bury their pet's body or cremains on their property. If you wish to do this, just be sure to check local ordinances, as it might be technically illegal in your area. After the burial, consider having a special headstone, stepping stone, or artistic sculpture placed in this area. You can also grow beautiful flowers or another plant there. Express your feelings in words with a poem, story, blog post, or another memorial to your dog. A written tribute will help you process your emotions. If you decide to publish it online, it can give others a chance to see the love you have for your dog and other pet owners may find comfort in it. Talk to people about your feelings. Discussing your grief with friends and family members can be helpful. Consider joining a pet loss support group in your area or online. You may even want to speak with a grief counselor to help you work through your emotions. The most important thing to remember is that grief takes time. You will always miss your companion, but things will get better. At first, there will be more bad days than good. Then, you will find that the bad and good days are even. Soon, you will have fewer bad days, and it will be easier to focus on the happy memories with less sadness. Your pet's memory may always be bittersweet for you. Future pets cannot replace your lost companion, but they might help fill a void. Just be sure to wait until the time is right. It is an unfortunate reality that humans will most likely outlive their pets. All that can be done is to be grateful for the short time you can share your life with these companions.